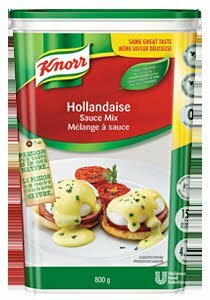 The original Knorr powdered Hollandaise sauce mix, rich and flavourful. 1. Melt 1.5 kg of salted butter or salted margarine over low heat.2. Blend in contents of this package (800 g) and stir well.3. Add 3 liters of cold water, bring to a boil and simmer for 1 minute stirring constantly. Economical way to make rich Hollandaise sauce of high quality and scratch method bacterial worry is eliminated. Simply make as per recipe on can. Add a little lemon juice, white wine or orange juice and a little orange zest for an interesting sauce to serve over fish and vegetables.